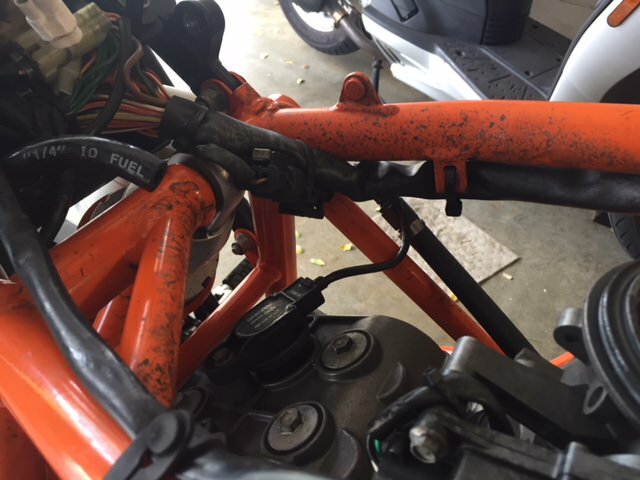 This Friday I rode and I had had a slight oil misting for a few weeks, from the bottom plate of the MotoHooligan air box, between the front and rear throttle bodies and I think this time I took care of it. Mostly the left side of my 'purty' orange frame was getting coated with oil. 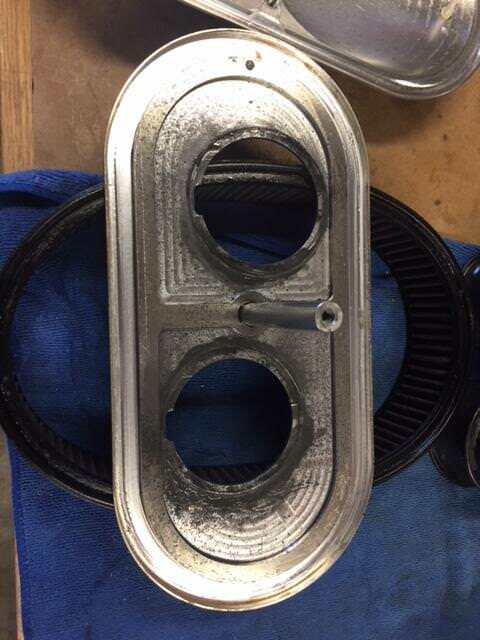 My uneducated guess was from the crankcase breather that is connected to the top of the air box. 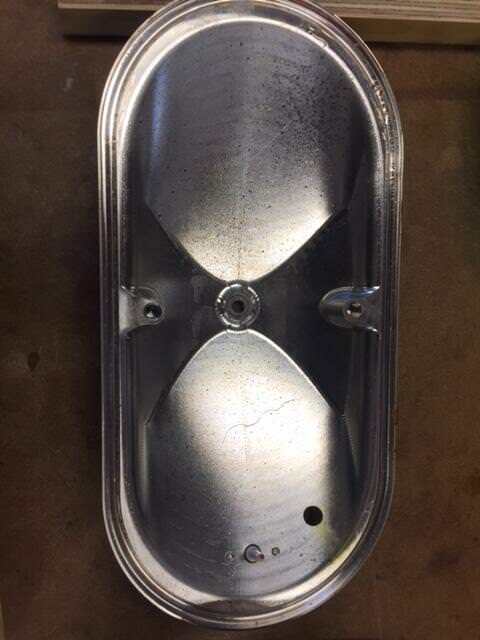 So I removed the tank, air box and cleaned all the oil and I came to this wonderful forum where I found (This link) that my airbox was installed properly (The rubber o-rings between the TB's and the bottom plate of the MH Box) so what I did was to use a little petroleum jelly between the velocity stacks and the bottom plate to seal the area better. If this does not work, I'll look into disconnecting the crankcase breather and installing a separate filter and catch hose on the side (As seen here). And those are some of the reasons why it's a love/hate relationship with my SD. Something always needs to be done after one or a few rides. Always. I've replaced the crankcase's one way breather valve, I've also replaced the balancer shaft seal. Twice (I buggered the first one) I'm at a loss at this point. Besides installing a K&N crankcase filter and routing it to drip somewhere below the bike; anything else I'm forgetting to check? Suggest disconnecting crankcase breather and running it into a temporary catch can first. No. 47 wrote: Suggest disconnecting crankcase breather and running it into a temporary catch can first. I was reading the EPIC thread about Basic and Advanced Breather mods, and the interesting 'conversation' between loony888 and indy84 and I saw that you modified your crankcase breather with the basic set up. You still have the bike set up like that? Aye, aye and aye re basic set up for #1 SDR (although still on bench awaiting rebuild ) - #2 SDR has T-piece with breather filter and outlet into airbox, no issues as yet. I'm so friggin impressed I shat me pants! I did Crankcase breather mod #1 and I've only ridden 5 miles (Went to get a full tank of non-ethanol fuel) and back. Smoother even 1st gear coming out of my driveway. Feels smooth as butter. More power (Not sure if I was being extra happy with the right hand). I pushed 2nd and 3rd and it stretched my arms. I was not expecting that. I will ride this weekend and do a full evaluation. Including looking at the reservoir (Plastic tubing w/ a cap) to see if there is any oil accumulated. After riding 90 miles today, not one hint of oil on the frame, throttle bodies or the discharge reservoir. With fingers crossed, I declare my bike sorted. Hope I don't have to do any work on it through the hot and humid FL summer. Just ride it, through the hot and humid summer. And what's the verdict on the difference in running/performance/smoothness? nampus wrote: And what's the verdict on the difference in running/performance/smoothness? Runs Honda smooth (is that good?). It picks up speed quicker. I’ve never done a proper dyno run but sit of the pants says it’s quicker than before. I’d highly recommend it. Even if your bike is not misting anything with blow by. Bit puzzled by the sudden lack of oil mist anywhere. No. 47 wrote: Bit puzzled by the sudden lack of oil mist anywhere. 270 miles later ... there is the smallest trace of oil in the reservoir hose, the transparent tubing has some light oil (yellow) coloring and there are maybe 4 to 5 drops in the cap (Bottom of the hose). So the system is working EXACTLY as intended. Crankcase breathes, oil deposits in the discharge hose. Engine does seem smoother, particularly at slow speeds. At higher speeds its the same. Power seems better. I even touched the rev limiter twice today as I was ehem ... testing with a buddy on his Concours 1400. I'd recommend doing this mod to the 990. I see no downside. 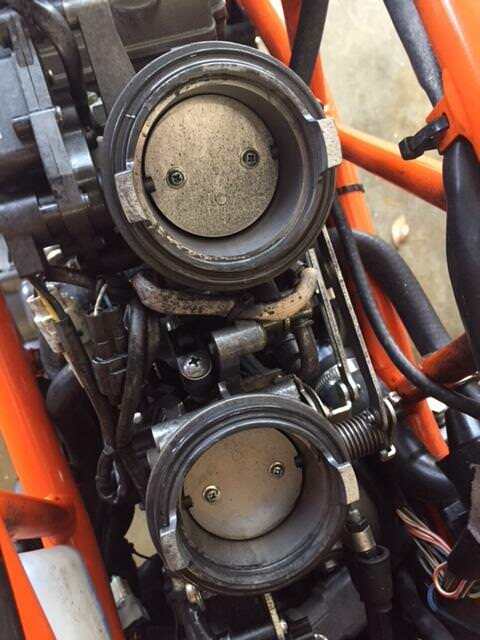 Particularly if you like to service the bike yourself, it's going to be unbelievably easy to remove the accumulated drops of oil from the discharge tube when you are changing your own oil/filter. If there is interest, I can do a "How to do it" but it was covered in 2008/2009 so the forum has enough pictures, diagrams and explanation that even I could do it. By myself. And I'm not that smart. Oh, and no traces of oil whatsoever on the frame, TB's or MotoHooligan box. Hoppefully I won't need it, but if ever comes up...oil catch can it's the way to go.